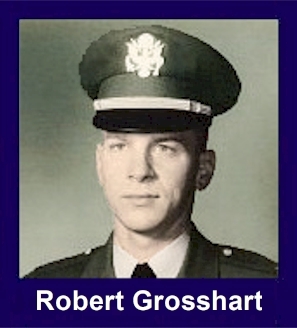 The 35th Infantry Regiment Association salutes our fallen brother, 1LT Robert Steven Grosshart, who died in the service of his country on June 11th, 1968 in Kontum Province, Vietnam. The cause of death was listed as Friendly Fire (Mis-Directed Mortars). At the time of his death Robert was 23 years of age. He was from Kansas City, Missouri. Robert is honored on the Vietnam Veterans Memorial at Panel 58W, Line 25. The decorations earned by 1LT Robert Steven Grosshart include: the Combat Infantryman Badge, the Soldiers Medal, the Bronze Star, the Purple Heart, the National Defense Service Medal, the Vietnam Service Medal, the Vietnam Campaign Medal and the Vietnam Cross of Gallantry with Palm Unit Citation. For meritorious service in connection with military operations against an armed hostile force in the Republic of Vietnam. First Lieutenant Grosshart distinguished himself while serving as a Platoon leader with A, 1/35th Infantry. Upon joining his unit, First Lieutenant Grosshart demonstrated a strong working knowledge of infantry tactics and the desire to achieve maximum results on all missions in which his unit participated. Demanding the highest performance from his men, First Lieutenant Grosshart in return gave them positive leadership of outstanding quality. Whether directing a patrol, perimeter security, or during an enemy engagement; First Lieutenant Grosshart maintained high personal standards and contributed significantly to his companys mission. Adjusting well to the constantly changing conditions and dangers inherent in a combat zone, First Lieutenant Grosshart was instrumental in implementing effective new tactics for his units area of operations. His cheerful attitude coupled with his concern for the welfare of his men earned him the respect and admiration of the entire company. First Lieutenant Grossharts outstanding achievements, personal integrity, and exemplary devotion to duty are in keeping with the highest traditions of the military service and reflect great credit upon himself, his unit, and the United States Army.